She's Sew Crafty: Recipe Challenge! 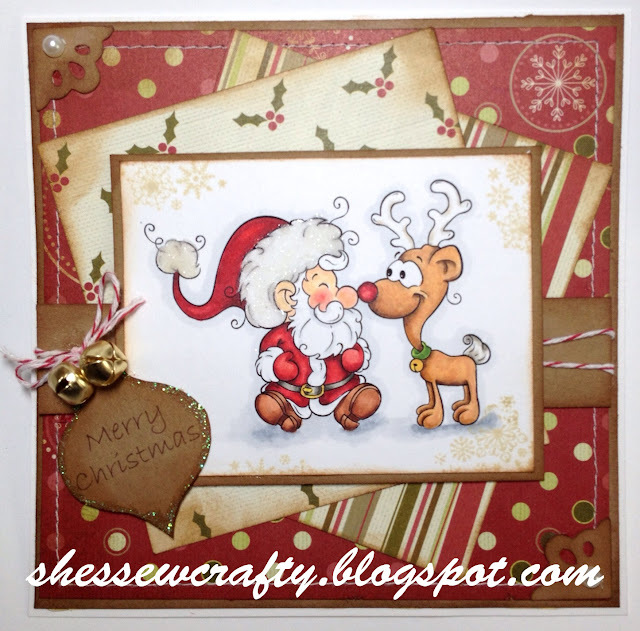 It's time for another fabulous challenge over at Stamptacular Sunday! For this weeks challenge you will create a card or project using the following ingredients: ribbon or twine, pearls or gems, and dies or punches! Oh…and don’t forget to STAMP! After all…we don’t call this the STAMPtacular Sunday Challenge for nothing! We have the wonderful Bugaboo sponsoring a prize of 7 digi's of the winners choice and Wild Orchid Craft's sponsoring a prize! I have used "Are You Ready My Friend?" by The Paper Shelter! I had entered their challenge a few weeks ago and was lucky enough to win my choice of 3 digis, so I took the opportunity to choose this sweet image! I loved the cartoon-ish cuteness! I thought my kids would like it, too! I used some old design papers and inked them with Vintage Photo and used Antique Linen to stamp the snowflakes around the image. I found the cute little bells at Joann's and had to buy the gold and the silver (and they really jingle!!) They had even smaller ones which I might have to but, too! The twine is from Wild Orchid Crafts, my fave place for flowers and metal corners (neither of which I used, lol). I glittered Santa's fur trim on his hat with snow glitter, but it doesn't show and glitter glue around my ornament die cut with the sentiment! And, pearls were my other ingredient in the die-cut corners! Don't forget to stop by the Stamptacular Sunday blog to check out what my teammates have done. There is all sorts of inspiration to enjoy! Danielle your card is so dang adorable!! !Such a cute image and your papers are beautiful! Thank you for playing along with us this week at Whimsy Challenge. Oh this image is just gorgeous, love it hun!